In case you missed this story, here’s proof that cats really do hold the Internet together. Belgium’s government placed the country and its capital city of Brussels under the highest level of terror alert during the week of Nov. 22, because of an “imminent threat.” The capital’s metro and schools were shut down and residents were told to stay indoors. 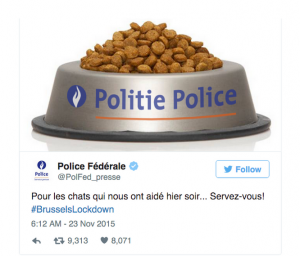 Following a police request for journalists to stop tweeting their anti-terror operational details, hundreds of Belgians made an effort to bury Tweets about police activites. 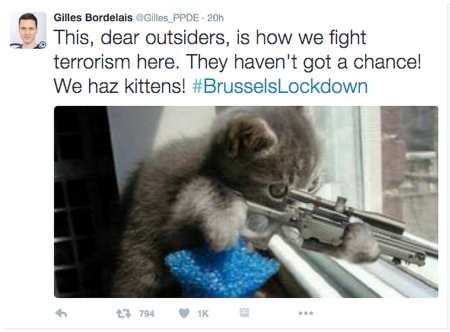 They began posting photos and videos of cats using the hashtag #BrusselsLockdown. Soon, people all over the world chimed in, creating a meme that trended on Twitter. “Good job, Internet,” said the NY Times.